In xkcd.com/1010 (I have a hard time not reading that as “ten”) I said that before 2004, there weren’t really any photos or videos of tsunamis. This isn’t quite true—there were a handful of photos and at least one video. When I was a kid, I was had an irrationally powerful fear of tsunamis (Etymology-Man would suggest “cymophobia”). I swam in the ocean a lot when I was very young, so waves were a big part of my world. I would fret about tsunamis whenever I was near the coast, and to this day I have occasional nightmares about a wave coming out of nowhere and sweeping me away. Looking back, part of what made tsunamis frightening was was that I didn’t know what they looked like, and my imagination ran wild filling in the gaps. I read what I could find about them. In particular, I remember being just old enough to work my way through this book, and carrying it around with me so I could read the tsunami section over and over. It included a grainy photo of a ship in a Japanese harbor plowing through an unimpressive-looking line of breakers. I think that’s also where I found a photo of some people running away from something (it was this photo, but the reproduction in my book was too grainy to see what they were running from). Years later, after the rise of the web, I realized maybe I could now find a video of a tsunami, and finally see the thing that had so captivated me as a child. But my searches for videos didn’t turn up much of anything. Then the 2004 tsunami happened. Shortly after, as YouTube and its various clones proliferated, there was more horrifying footage available than I could handle. 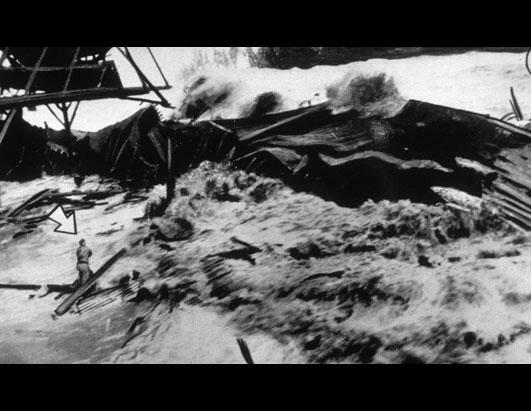 A year or two ago, I read an article somewhere (I have tried to find it again with no luck) which mentioned that before 2004, there hadn’t been much in the way of photographic or video records of tsunamis, and that this had contributed to a lack of understanding of their form. My childhood impression seemingly confirmed, I worked this into a comic. It turns out I was mistaken. There are several photographs, some of which can be seen here, here, and here. There’s also a video here (sent in by Phil Plait). I think what confused me as a child was that none of the photos showed the wave I expected—just debris, and occasionally some visible water. Now that I’ve seen horrifying videos like this, I’ve gone back to some of those old photos and realized that they did show a tsunami. It was just so unlike what I was expecting that I didn’t recognize it. So thank you to everyone who sent in information. It’s really fascinating stuff. Oh, and anyone interested in the history of tsunamis might want to check out a Google Books advanced search for material published before 1850 containing phrases like earthquake wave, earthquake tide, or earthquake water feet. There are some gripping historical accounts buried there, along with some really interesting speculation by 19th-century scientists about the mechanisms behind earthquakes and their associated waves (the consensus seemed to be hot gas moving between subterranean chambers). you that you have people like me who appreciate your work. if you have anything to do with Klout, you want someone to klout you? can you show me to link ? The one I have in front of me is the Toike Oike, the University of Toronto’s long-running high-quality humor newspaper. I must say that the articles in this blog are very interesting to read. Fantastic post I like the document appreciate the method that you described.